Schedule our $49 performance and efficiency tune up today! AC just cant keep up? I cannot say enough good things about Dante and Andy. They stepped in and stepped up when no one else wanted to take on my "crappy" job. They went above and beyond as the job became more than intended because the more they fixed, the more they found and rather than just putting a bandaid on it and walking away, they made sure it was done right and within budget. Dante made sure to take the time to explain everything to me and never once acted like I was just the wife and not the homeowner. He was very respectful, patient, and understanding of my situation. Not to mention working around all of my animals and making sure they were always secure and safe in the working the environment. Overall, these guys took a really bad situation and made it a good experience. Thank you Dante & Andy! Very professional and knowledgeable. Did a great job replacing our furnace, even considering the numerous problems discovered along the way. They even cleaned up after themselves. We would highly recommended 24/7 air! Are You Prepared for the Upcoming Season? 24 7Air has you covered! Your home can't be very homey if it isn't comfortable enough for you. If it's too hot or too cold in your Twin Falls, ID home, you can rely on 24 7Air to diagnose your air conditioning system for you. We can determine if your HVAC system, furnace and/or heat pump needs to be repaired or replaced, and we can complete regular maintenance services to keep it in the best condition. Dial 208-358-7402 to learn more about our services. Is Your HVAC System in Good Condition? Contact us at 208-358-7402 to schedule a repair, replacement or maintenance service. 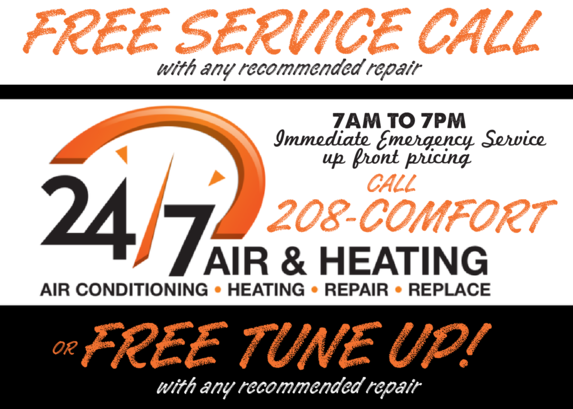 24 7Air is an HVAC company located to Twin Falls, ID. With 15 years of experience in the heating and cooling industry, we're dedicated to helping you maintain a comfortable climate within your Twin Falls, ID home. Our HVAC contractors can diagnose the problem and also do the work to get your system running in tip top shape including repairs, or a furnace or heat pump replacement. We offer heating and air conditioning replacement, repair and maintenance services for residential properties in the area, and we're intent on completing thorough work with lasting results. We have a team of experienced technicians who are ready to troubleshoot your heating and cooling issues and offer excellent customer service. Choose 24 7Air to upgrade, repair or maintain your HVAC system. Copyright © 2019 24 7Air, all rights reserved.